Need a nutritious feel good meal? 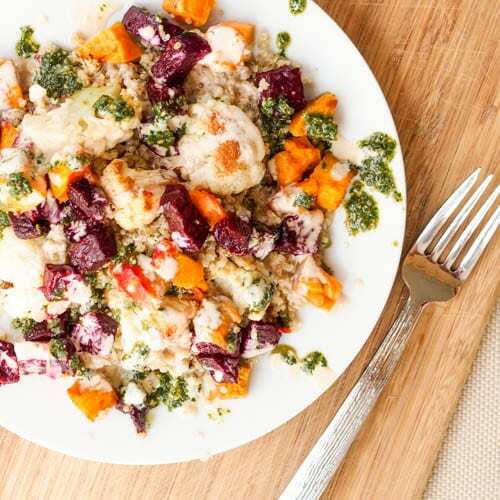 Look no further than this vegan quinoa power bowl with oven roasted beets, cauliflower and sweet potatoes, drizzled with a tahini sauce and vegan basil pesto. Gluten-Free too. After last weekend’s sailing adventure (or more accurately boating accident) it was time for a bit of a detox. When friend and family are in town all my eating and drinking self control goes right out the window and is replaced by one word : indulgence. Prosecco and wine is abundant and tons of delicious (and not so nutritious) meals and snacks are always tempting me from the kitchen. With everybody eating and drinking, non stop (and I mean seriously non stop) it is a bit outside of my control to resist. And so it goes – my eating habits see-saw between the occasions when I simply go wild with everything I put in my body, and then all the other times when I go on a strict nutritional body cleanse. So far that is my best strategy for balance. I know – it needs improving. For now it’s what I got, so after eating plantain chips by the handful, several carb loaded sandwiches a day, and fire pit smore’s for dessert ( I mean I did need to teach my parents’ friend visiting from Moscow about some true American classics) my body was in serious need for a reboot. 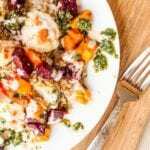 Cue this vibrant vegan quinoa power bowl with colorful veggies and a creamy tahini based sauce, finished off with a drizzle of my go to classic vegan basil pesto. If you ever feel like a wilted flower, this right here is the recipe for you. I’ve figured out the secret to perfectly and I mean perfectly cubed and roasted sweet potatoes. 425 degrees F. That is the sweet temperature for those little orange cubes. Give them a stir half way through and they will be lightly browned on both sides once you take them out 40 minutes later. As for the beets – those take a while to roast and you’ll be surprised that you’ll be looking at half the amount of beets you put in. Those little guys just shrivel right up. Seriously though roasted beets? All my Russian life I’ve been tricked into only eating boiled beets – such a scam, until I’ve finally uncovered the sheet flavors of the roasted variety! Oh my – so good. And that color. Come on, it just makes any dish pop. I don’t even need to mention the cauliflower — you know I love that, and once it’s roasted I eat it with the same hand motions that I use for popcorn — can I get it in a big bucket – puhhlease? The tahini sauce in this is a blend of lots of different flavors so you have a mildly sweet, salty, rich and creamy sauce. Then boom add in a few plops of vegan basil pesto for the ultimate color rainbow on your plate. Dinner? Yes please. Worth of lunch leftovers? You bettcha. For a similarly delicious yet slightly different quinoa power bowl also try out my Vegan Quinoa Bowl with Roasted Veggies and the best creamy avocado sauce in the world. Need a nutritious feel good meal? 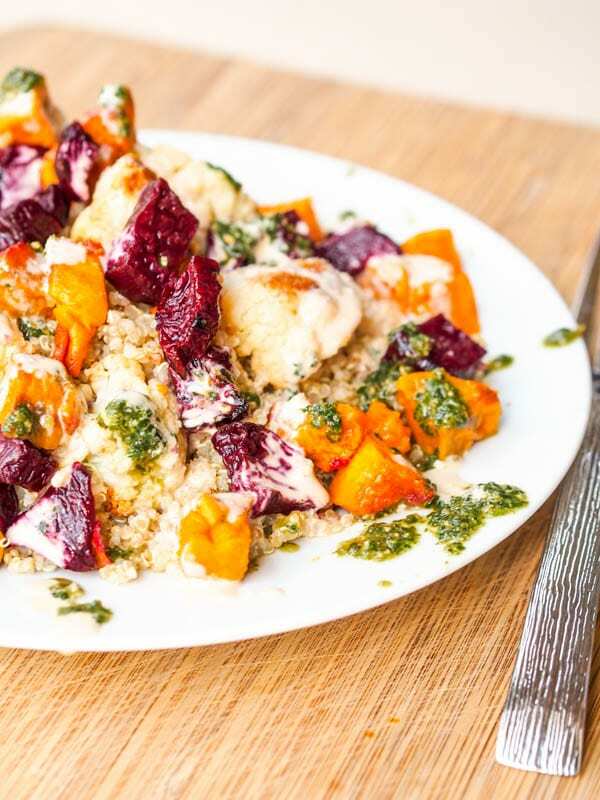 Look no further than this vegan quinoa power bowlwith oven roasted beets, cauliflower and sweet potatoes, drizzled with a tahini sauce and vegan basil pesto. Gluten-Free too. In a bowl combine sweet potatoes, 1 tablespoon olive oil and salt to taste. Toss until thoroughly oiled. Repeat the same process for the beets and cauliflower. In separate baking sheets (or separate parts of the baking tray) in a single layer on aluminum foiled sheet spread out the sweet potatoes, beets and cauliflower. Bake for 40 minutes, stirring at the half way mark. Remove sweet potatoes and cauliflower and continue to bake the beets for another 10 minutes if needed. Heat pot over medium heat add 1 tablespoon olive oil and quinoa. Cook until lightly toasted and add 2 cups of water. Bring to a boil, add salt to taste, reduce heat and simmer, covered for 15-20 minutes or until cooked through. In a small bowl combine the tahini sauce ingredients and mix until smooth. 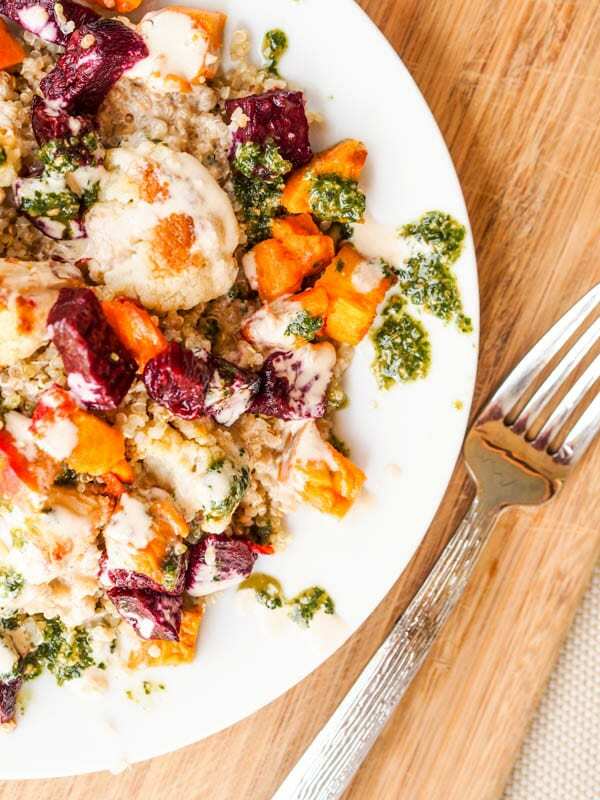 Serve quinoa topped with roasted veggies, tahini sauce and pesto. Difficult to read with all the INTRUSIONS of advertisements. When you push the X to get rid of the AD it just pulls up. This has happened repeatedly. It’s like driving through a huge detour w major construction, very frustrating. Please look into it, perhaps some of your other loyal viewers feel the same way.